All EOF Scholars are required to attend the May 18th EOF Orientation. Here, students and parents/guardians will learn about the EOF Pre-Freshmen Studies Summer Program. EOF Scholars will meet with their EOF Student Development Specialist, discuss potential class schedules, and get to know other EOF Scholars. Parents/guardians will meet with the EOF Director. Students will also meet with the Office of Financial Aid. The EOF Orientation will be held in the Trustees Pavilion . Breakfast will be provided. The EOF Orientation will conclude at 12:30pm. If you have any questions about this event, please call the EOF Office at 201-684-7542. Below are the summer bridge program’s orientation weekend schedule and all forms needed to finalize participation in the Prefreshman Summer Studies Academy. Students should access these forms after being admitted to the college and EOF Program, and after having completed the Accuplacer Placement Test. Please note: The EOF move in weekend stars on June 22nd. Activities will be held on June 22nd and June 23rd. Students are required to stay on campus the entire weekend. Times for moving in on Saturday, June 22nd will be sent via email. Typically, students will move in between 9:00 am and 11:30 am. All EOF Students MUST meet with Ms. Nunez in the Office of Financial Aid when they come for their Ramapo Orientation. To set up your appointment, please call 201-684-7242 or email her at tnunez@ramapo.edu. You must meet with Ms. Nunez to complete your financial aid award package. In addition to completing the online forms, please complete the following documents, print them and bring them with you to the EOF Orientation on May 18th. Do not use your cell phone to respond. Log into the Ramapo Intranet using your Ramapo email address. If you continue to experience difficulties, please contact the Ramapo ITS Department @ 201-684-7777 or via email helpdesk@ramapo.edu. The EOF Pre-Freshman Summer Studies Program is the bridge to academic and social success. EOF students entering their first year of college are required to attend our Pre-Freshman Summer Studies Program. The program typically begins the last weekend in June and concludes six week later in the month of August. All students are required to reside on campus and are enrolled in two to three courses, one seminar, Study/recitation sessions and advisement sessions built into each student’s schedule. Tutorials are also built into the student’s academic schedule and are held between classes during the day and on selected evenings. The tutorial sessions are conducted by either professional tutors or upperclassman, many of whom having had prior job experience working for the Center for Academic Success. They attend classes to stay abreast of course content covered by faculty. There are also student life activities consisting of social, cultural, recreational and educational events, which run throughout the six-weeks. Course tuition, fees, room, meals, books, insurance, are all paid by the EOF Program. 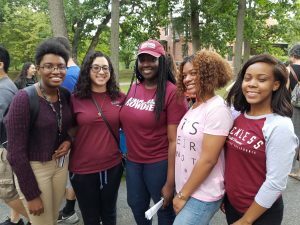 The college’s Center for Academic Success, Office of Residence Life, and Office of Student Activities and many other college departments are all involved in the design and delivery of the Pre-Freshman Summer Studies Program services.